FIFA Women's World Cup Final: U.S. Takes On Japan: Live Blog : The Two-Way Japan became the first Asian nation to win the Women's World Cup on Sunday, beating the United States in a penalty shootout after both sides were level at 2-2 after extra time. The Japanese denied the U.S. team the chance to become the first nation to lift the cup three times. Japan's midfielder Homare Sawa (R) and USA's midfielder Carli Lloyd vie for the ball during the FIFA Women's Football World Cup final match in Frankfurt. The U.S. women's national team tries to take its first World Cup title since 1999 Sunday, facing a Japanese team that has become a sentimental favorite in Germany, the host nation. The two teams played to a 1-1 tie at the end of regulation, and the U.S. took a 2-1 lead just before the half of overtime. But Japan came back to make it 2-2, and then won on penalty kicks, 3-2. You can catch video highlights of the game at the FIFA site. Postgame reaction and analysis is here. Update: 5:21 p.m. ET: Solo can't make the save, and Japan wins on penalty kicks. Update: 5:20 p.m. ET: Hope Solo gets a hand on the ball, but can't stop it from going in. Then, Abby Wambach scores a penalty kick to make it 2-1, Japan. Update: 5:19 p.m. ET: U.S. sub Tobin Heath misses her penalty kick, making it three misses out of five for the Americans. Update: 5:19 p.m. ET: U.S. goalie Hope Solo makes a save. Update: 5:18 p.m. ET: U.S. misses another penalty kick, as Carli Lloyd's shot skies over the net. Update: 5:17 p.m. ET: Japan leads the PKs 1-0. Update: 5:17 p.m. ET: Shannon Boxx hits the first penalty kick to the right, and it's saved by Japan. Update: 5:14 p.m. ET: Japan's coach ended his huddle with players with a huge smile and laugh. Update: 5:11 p.m. ET: The free kick by the U.S. crosses over the endline as Tobin Heath tried to guide it into the net. Overtime is called; penalty kicks now. Japan and U.S. tied, 2-2. Update: 5:10 p.m. ET: Japan has been hit with a red card as Alex Morgan was taken down at the edge of the box. Update: 5:08 p.m. ET: Wambach misses a chance to put the ball in the net after a nice low pass. She was sliding as she shot. Update: 5:05 p.m. ET: Sawa scores on a corner kick in the 117th minute, 3 minutes short of the end of the game. The ball came in after Hope Solo received treatment, following a tumble in front of the net. Update: 5:03 p.m. ET: Defender Tobin Heath comes in for Megan Rapinoe. Update: 5:01 p.m. ET: Japan threatened again, but the ball somehow didn't go into the net, despite confused defending by the Americans. They survive, and Hope Solo will kick it back into play. Update: 4:57 p.m. ET: Japan sent a dangerous hard, low pass into the box, and it caromed around enough to resemble their earlier score. But O'Reilly clears to end the threat. Update: 4:53 p.m. ET: The goal at the 104th minute of the title game puts the U.S. ahead, 2-1. The ball was served up by Alex Morgan after Rapinoe's pass was deflected toward the endline. Update: 4:50 p.m. ET: Wambach scores, heading in a low pass. Update: 4:46 p.m. ET: O'Reilly sends a nice pass to Wambach at the corner of the box, but she can't get a shot. Corner for U.S. goes long. Update: 4:44 p.m. ET: Japan's Miyama gets the first yellow card of the match for a hard tackle. Update: 4:43 p.m. ET: Morgan outruns the defenders down the right-hand side, but her shot goes wide left. Update: 4:41 p.m. ET: The U.S. has several chances, but can't send it home after the ball pinballed around the Japanese end of the field. Rapinoe took a corner kick to start it. The best shot was Wambach's header, which the Japanese goalie caught in the air. Update: 4:38 p.m. ET: Play is under way in overtime. Update: 4:37 p.m. ET: U.S. coach Pia Sundhage gave her players a talking-to in the huddle. Update: 4:34 p.m. ET: Whistle blows, and 30 minutes of overtime is on the way. Update: 4:32 p.m. ET: We're in stoppage time — 2 mins. Update: 4:31 p.m. ET: U.S. threatens several times, but Japan's defense holds as the ball crosses all over the box with American strikers lurking. Update: 4:28 p.m. ET: Both teams are kicking it around in the midfield. One more minute until stoppage time, and overtime looms in a 1-1 game. Update: 4:27 p.m. ET: Japan sends the corner kick out, and then withstands a run by Wambach for an attempt at a header on a long pass. Japan's defenders are playing physical soccer. Update: 4:25 p.m. ET: The U.S. prepares to take a corner kick. Update: 4:23 p.m. ET: Japan's equalizing goal at the 82nd minute came after Rachel Buehler kicked the ball across the front of Hope Solo's net. Miyama flicked it from the center of the goal out toward the corner and into the net. Update: 4:21 p.m. ET: Japan scores after the ball ping-pongs around in front of the net and two U.S. defenders missed clearing chances. Miyama scores to make it 1-1. Update: 4:20 p.m. ET: The U.S. is kicking the ball around in their own end, as Foudy and Darke of ESPN wonder when Japan will get more aggressive. Update: 4:18 p.m. ET: As we get into the last 15 minutes of play, the U.S. is slowing play down with short passes to maintain possession. The Americans lead, 1-0. Update: 4:14 p.m. ET: Japan seems more desperate, down 1-0. U.S. players are beginning to get laid out by aggressive challenges from the defenders. Update: 4:12 p.m. ET: Hope Solo scoops up a shot by Japan's Homare Sawa. That was two quick chances. Update: 4:12 p.m. ET: Hope Solo scoops up a shot by Japan's Aya Sameshima. Update: 4:10 p.m. ET: U.S. leads 1-0, after Rapinoe fed Morgan with a beautiful pass down the center-left part of the field. Morgan streaked downfield with a defender chasing. As the goalkeeper faced her, Morgan shot with her left foot and buried the ball in the far back corner of the net. Update: 4:09 p.m. ET: Alex Morgan scores on a breakaway counter-attack. Update: 4:05 p.m. ET: Wambach hits a strong header off a looping pass from midfield, but Kaihori saves it in the center of the net. Update: 4:03 p.m. ET: Rapinoe takes another corner kick, sending this one to the top of the box. But Japan takes control of the ball. As set pieces begin, Japanese players are gluing themselves to Wambach and Morgan. Update: 4:03 p.m. ET: The score's still 0-0 after Homare Sawa loops a pass over three players to drop in front of a teammate. But her shot is way too high. Update: 4:01 p.m. ET: Japan had a nice long ball, but U.S. goalie Hope Solo snapped up the ball as soon as it entered the box. Update: 3:58 p.m. ET: A U.S. corner comes to nothing after Japan (and seemingly the U.S., as well) put all their focus on Wambach. Heather O'Reilly set up the corner by fighting the ball past two defenders. Update: 3:57 p.m. ET: At the 55-minute mark, Japan has controlled possession for 53 percent of the match. The U.S. has taken 15 shots on goal to Japan's 5. Update: 3:54 p.m. ET: Megan Rapinoe feeds a beautiful ball to an onside Abby Wambach, but the ball skies over the goal. Wambach can only smile. Update: 3:52 p.m. ET: U.S. defender Heather O'Reilly draws whistles and boos for fouling Japan's star, Homare Sawa. But no yellow card. Update: 3:50 p.m. ET: Alex Morgan hits the righthand post with a close one-time shot, but Japan's defenders were there to kick it away. The ball had come in via a low, driving corner kick to the near post. Update: 3:45 p.m. ET: U.S. striker Lauren Cheney is out for the second half, due to a sprained ankle that swelled as the first half went on. Seems to have happened early in the match. Second half is under way. Update: 3:41 p.m. ET: ESPN says that U.S. coach Pia Sundhage was very animated at the half, telling her team to be more aggressive and finish. Striker Alex Morgan, who came in for the second half of the game against France to score, is on the field warming up. Update: 3:31 p.m. ET: That's the half — 0-0 tie. The half was whistled after only 15 seconds of play past the 45-minute mark. There's been no flailing on the ground or delays to speak of. Update: 3:28 p.m. ET: Japan seems to like to start its attack from the far edge of the left sideline. The Americans seem to have figured this out, and are creating havoc over there. So, Japan sends it to the far right side and nearly misses a chip shot on goal. Update: 3:26 p.m. ET: The U.S. has been called for two slight pushing penalties in the past couple of minutes. In both cases, the match referee made the call and smiled as she talked to the players. So, no dramatics on that front, as of yet. Update: 3:24 p.m. ET: Japan takes a corner kick, but Nahomi Kawasumi sends her shot far above the goal and into the crowd. You may recall, she had two goals in one match earlier this Cup. Update: 3:20 p.m. ET: Megan Rapinoe takes a free kick from far outside, which then leads to a long feed from Christie Rampone. But Lauren Cheney's header slides over the top of the net. Update: 3:16 p.m. ET: Japan's Kozue Ando slipped behind 4 defenders to face U.S. goalkeeper Hope Solo, but her shot was gathered in. Moments earlier, ESPN's Julie Foudy said the U.S. is playing a "compact defensive style." Update: 3:14 p.m. ET: Abby Wambach's shot hits the underside of the pipe and ricochets back into play. But it's cleared away. She had streaked down the left side to create the chance. Update: 3:10 p.m. ET: U.S. corner kick is wide; Abby Wambach's flick toward the net is swept up by Japan's keeper, Ayumi Kaihori. Update: 3:09 p.m. ET: At the 24th minute, possession is nearly even, at 51 percent for Japan and 49 percent for the U.S. But the Americans have taken 9 shots to Japan's 1. Update: 3:03 p.m. ET: ESPN's Ian Darke says Carli Lloyd "doesn't have her shooting boots on yet." The U.S. is outshooting Japan, but to no effect. Update: 3:02 p.m. ET: The first 15 minutes have been dominated by the U.S. squad. Japan's goalkeeper has been kept very busy. On the sideline, Japan's coach has his arms crossed. Update: 3 p.m. ET: The U.S. women are keeping possession of the ball, one of coach Pia Sundhage's keys to playing well in this match. The Japanese women are controlling the ball on their own side of the field, but as they cross midfield, the U.S. players are disrupting passes. Update: 2:57 p.m. ET: Carli Lloyd narrowly put her rebound shot over the net. That's three nice early chances for the Americans. OR - make that FOUR chances. Megan Rapinoe missed a one-timer from the right-hand side of the box. Update: 2:54 p.m. ET: Midfielder Megan Rapinoe feeds a nice pass to Lauren Cheney, but her shot is just wide. Rapinoe started today for the first time in the Cup; she had been moved to the bench before the first game. Update: 2:46 p.m. ET: U.S. forward Lauren Cheney started the action by making a run down the left side, but her centering pass was deflected out of bounds. 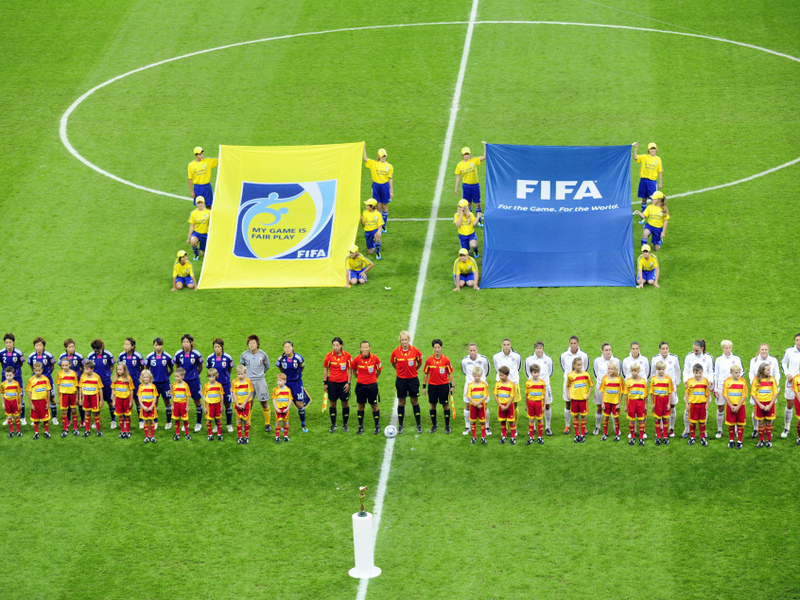 Players of the USA (R) and Japan stand in a line prior to the FIFA Women's Football World Cup final match of Japan vs USA on July 17, 2011 in Frankfurt/M., western Germany.